That was a rather thrilling weekend, no? Friday was not the best day, as I didn’t realize it was icy and tumbled down my front steps, and then my car puked out a bunch of oil in my driveway. It ended well, though, because I wasn’t hurt and the fix ended up only being $67, which is approximately 10% of what I thought it would cost. Also my dad met Nick Kemp in the airport. So that was good. I didn’t feel very confident about Saturday’s game. At all. tDogs were slumping, but the Goofs were like cornered, wounded, rabid… rodents, you might say. Before the game, all I could think about was, whoever loses this game has effectively ended their season. 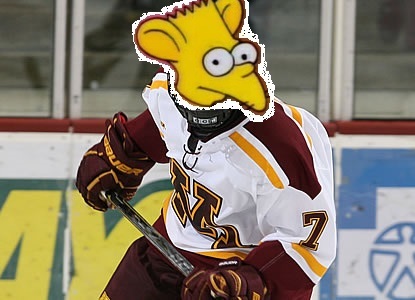 tUMD carried the play for 40 minutes, and then gave up some weird flukey goal to Ratboy himself, Rau. That was all the Goofs could get by McNeely, although most of the time they were killing their own power plays and breaking up their own scoring chances. Meanwhile tUMD’s SUPERIOR captain scored his second goal of the night on tUMD’s first shot of the third period, which came with just over 2 minutes to go in the game. Talk about your daggers. I choose to believe that this is a turning point for tUMD, and their mini slump is over. I don’t know why it feels like a bad slump when really it wasn’t, but it did cost the team a 1-seed in the PWR and their lead in the conference standing. Still, better to slump now than when it’s single elimination time!